I have been in a bit of an organizing/purging/reevaluating mood lately. Since I seem to be spinning my wheels in the basement - I swear, I work and work and work down there, but it does not get any better! - I thought I would switch my focus to another room for a while. I need some sense of accomplishment! The kitchen. It is fairly organized already, just in need of some minor tweaking. 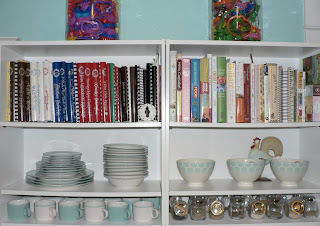 I am contemplating one long shelf for my overflowing cookbook collection. Right now it takes up the top row of these shelves and the bottom row of another. Both are busting at the seams! I really do not enjoy tearing a fingernail off every time I try to pull one out. While looking through my collection I noticed a progression of sorts. From when I did not have a clue how to cook to being curious about cooking to donning an apron while cooking from scratch, the books portray the evolution of my culinary life. In the beginning there was "Campbell's 1-2-3 Dinner". A *delightful* little "cookbook" that gets dinner on the table in 20 minutes or less and always contains a can of soup. I lived for soup, quite literally. More often than not my meals consisted of a can of soup nuked for 3 minutes. I was too inept to even make the simple meals of this book that required nothing more than chicken or ground beef, a can of soup, and some pasta. Then Miss "Campbell's 1-2-3 Dinner" met Mr. "A Man, A Can, A Plan" - my husband. Boy were we a match made in Schwan's man heaven. We bought so much processed frozen food that the Schwan's man gave us a freezer! Undoubtedly so we would have room to purchase even more chicken patties and push-ems. This is how our family lived. From boxes and cans and plastic bags out of the freezer. Quick and easy, without giving much thought to the "food" we were putting in our stomaches. As long as they were full, life was good. Then I turned 30. I figured it was time to grow up and cook like an adult. I subscribed to Kraft Food's "Food & Family" magazine and collected Gooseberry Patch cookbooks. Collecting cookbooks and looking at food pictures is almost same the same as actually making it, right? Slowly I ventured from Hamburger Helper to semi-homemade versions of it. Around the same time I set out on my green journey. Packaged food turned into bulk goods, I started shopping at the Farmers' Market, and began spouting words like "organic" and "natural". This is when the "The Sneaky Chef" and "Deceptively Delicious" cookbooks entered the ranks. I was looking for ways to get my family to eat more vegetables without them actually knowing it. The plastic bags in the freezer were slowly being replaced with Ziploc bags of pureed zucchini, squash, and cauliflower. Then Michael Pollan entered my life and all hell broke loose. I joined a Local Foods and Sustainable Agriculture task force, learned about CSAs (Community Supported Agriculture), put in a garden, and added GMO, free-range, and bechamel to my vocabulary. My Christmas and birthday lists included items like pressure canner, food processor, cast-iron cookware, bread machine, and so on. Books on root cellaring, preserving the bounty, and composting rubbed elbows with "Healthy Bread in 5 Minutes a Day", "In Season", and "Vegetarian Bible: Fresh from the garden." My food went from being dumped out of a can to local, fresh, in-season, whole, organic, humanely-raised, and cooked from scratch. In only a few years! It amazes me how one small step can take you in directions you never dreamed of. I am not quite sure how wondering what all those long words on the back of my shampoo bottle were, led to making my own sauces and brown sugar, but it did. This green journey has permeated all aspects of my life. Now our Mondays are Meatless, our recycling and trash bins are lighter, and the vegetables are prominently displayed in unapologetic portions. Makes me wonder where we will be in another three years? I have yet to get that shelf up in the kitchen for my ever-growing cookbook collection, but looking back at my transformation I do feel the sense of accomplishment I was looking for. In hopes of encouraging someone else to embark on a sustainable culinary quest, I would like to provide a roadmap of sorts. Who knows where this guide will take you? The destination is completely up to you. It may lead to places you are not even aware of yet, but once you get there you will look back and wonder, "How did I ever live before?". 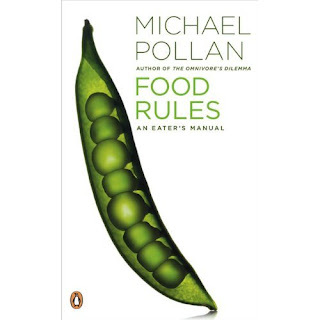 Tell me one thing you currently make that you never dreamed you would before and one thing that you still wish to master and I will enter you into a drawing for Michael Pollan's new book "Food Rules". It is like crib notes for "In Defense of Food". You have until Sunday, January 17 to enter. I will announce the winner in my post next Monday. 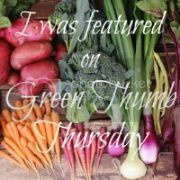 While you are at it, hop on over to my personal blog, Greeen Sheeep, and enter to win a reusable lunch kit to carry all your home-cooked goodness in. Drawing ends January 13! hahaha! I think I'm on the verge of all hell breaking loose. I can't believe how much veggie soup I made — with tomatoes from my own garden! — especially since I wouldn't even eat it as a child! I would love to learn to make bread that the whole family likes. I make all our rolls, hamburger buns and lots of our other bread. I also make all of our pizzas from scratch. It's exciting to me to think of all the things I'm making from scratch now that I wouldn't have even thought of making a few years ago. Well, I guess the one thing that I make that still sounds a little funny when I tell people is yogurt...but it's SO easy and so much yummier! Chicken broth - I never thought I would be buying whole chickens rather than boneless/skinless just so I could have both the broth and the meat. I really want to learn how to make tasty fried chicken, I know the "fried" word is not generally considered to be healthy, but sometimes I just get a craving for good fried chicken like my mamaw used to make. I never learned how to cook it in my younger days, and take-out just isn't that good. Hmm...I can't believe I make yogurt myself, and I can't believe I keep a bucket of dough in the fridge at all times to just "toss in" a quick loaf of fresh bread for dinner. I am still mystified by Really Good Pasta Sauce, though. I make my own, we eat it, it's acceptable, my husband is polite, but I know the flavor in the commercial stuff is still better than mine. And I remain convinced that it's about more than just my not adding so much salt. I make lots of things now that I can't believe, but the biggest thing is actually chicken soup. I married a nice Jewish boy and couldn't make it to save my life and now I make a dang good scratch chicken soup from leftover chicken carcasses and homegrown veggies. I even can it! I'd still like to learn more about fermenting. The list is long though. Great post! The personal evolution of green...definitely something I've been reflecting on, too. I'm thrilled that I make our bread, which is something I wouldn't have thought to do 4 years ago. I'd like to learn how to preserve and can food this summer. I'd like to be able to make cheese, and have signed up for a local course. The brew-your-own-beer shop across the road has cheese-making, sausage-making, and yogurt-making equipment too so I'm going on an excursion this Saturday! I make my own broth, be it veggie or chicken. It's so easy I can't believe why anyone would want to buy ready made broth in cans and cartons. I would like to make my own tomato puree, but it's hard to master. That is really inspirational. I still can't believe I've started making things like soup and custard - especially since I'm the type of person that burns things like a crazy person. i can't wait to be where you are.... someday!! I'm still working on making bread, and my list of "from scratch" healthy eating is huge... more than making or mastering certain foods, I'd really love to expand my preferences and meal repertoire- so I can truly eat in season up here in COLD Canadian winters. Congrats on such a successful progression! for me--it is cooking anything at all that is the biggest surprise. and then, taking all of our "order in," "take-out," and "fast-food" favorites and making them at home, from scratch. like french fries baked in the oven, smoothies, pancakes, pizza, chicken tenders. I would love to learn how to bake bread and crackers and pretzels. I would love to cook and bake with my daughters for fun, as opposed to for fuel. Great variety! We received several cookbooks for Christmas and birthdays. They vary from a historical book (Dining on the B&O Railroad) to the practical (Quick Fixes with Mixes). We're already marking them up with sticky notes and putting ingredients on the grocery list! I never thought I'd bake bread, particularly sourdough, and next I want to be a successful gardener. I think I'll go with whole grain tortillas (spelt and whole wheat) as the one I've mastered. As for the one I'd love to learn. Hmmm. Hard apple cider would probably be it. I can't believe that I learned how to make creamed soup. Now I have several packages in the freezer available for whenever the need arises. It is awesome. Over 13 years ago, at the rehearsal dinner for my wedding, I laughed and rolled my eyes when I heard that when our caterer made chicken soup from scratch, it meant she made the noodles. Now I know how, and I make them with duck eggs sold by a lady who has become a friend at the farmers market. I want to learn how to make yogurt to get rid of all those plastic containers, I've yet to try canning and, like Jenn, I'd really like to make a pasta sauce that tastes better than the kind I can buy to go on those noodles. i want to bake more snacks--eliminating the packaging from our home and harmful ingredients from our diets. and i really want to learn more about sprouting grains and actually do it.